To ride off on a motorcycle smoothly, you’ll need to master clutch control and to do this, you’ll need a basic understanding of the clutch bite point, or ‘friction zone’ as it’s also referred to. Why will you need to master clutch control? Moving off from a stationary position being good example. Ever seen a car or motorcycle stall when moving off? That’s clutch control – or lack of. Hill starts will need a greater level of clutch control and another frequent use of this skill will be slow moving. A typical example is riding in traffic queues for example. You may have simply heard of the word ‘clutch’ and that’s about it. If you have no basic knowledge on how a motorcycle clutch works, then that’s the best place to start. Nothing technical, just a very basic idea of what’s going on and this should help when you give it a try for real. Think of the motorcycle engine being connected to and powering the rear wheel. If they were permanently connected, you wouldn’t be able to stop the motorcycle without stalling and you wouldn’t be able to change gear. So you need something to break this connection and this is exactly what the clutch does. Think of the clutch as two flat plates that separate and come together. 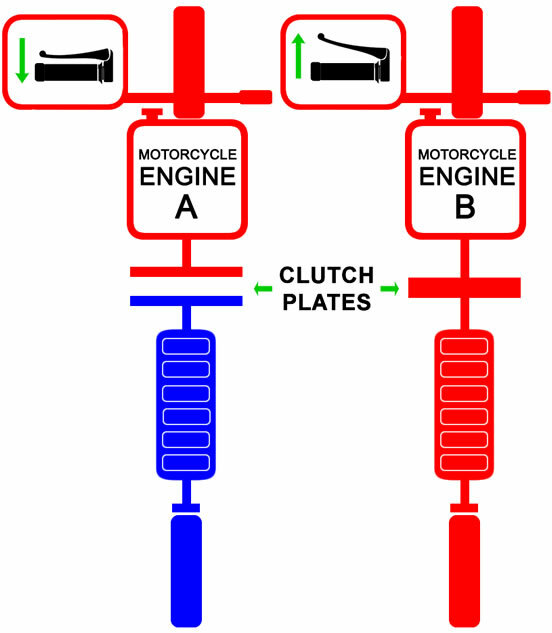 When the clutch lever is squeezed in as with motorcycle engine A in the diagram, the plates separate. When the engine is switched on, it is constantly providing power to the rear wheel. Squeezing in the clutch breaks this connection allowing the engine to still run, but with no power being sent to the wheel – ideal if you don’t want to stall. With motorcycle engine A, one of the clutch plates is connected to the engine and is constantly spinning along with the engine. The other clutch plate is stationary. Clutch plates join together by a combination of force (pushing against each other) and once pushed against each other, spin in sequence also by use of friction. With motorcycle engine B, the clutch lever is released and so connecting the two clutch plates together providing power from the engine to the rear wheel. So in simple terms, that’s what’s going on between the engine and the clutch. Now, if you wish to ride off from a stationary position, you’ll need to select 1st gear. This is where you’ll need to learn clutch control and an understanding of the bite point / friction zone. We briefly touched on friction being how the clutch plates join together and spin in sequence. As can be seen in the diagram, this is the clutch bite point or friction zone. The bite point of a motorcycle clutch can vary within the working travel of the clutch lever. Each and every clutch is different depending on the type of clutch, how well maintained the clutch cables are, how worn the clutch is, they types of motorcycle etc. So expect the bite point to be in a different location on each and every motorcycle. 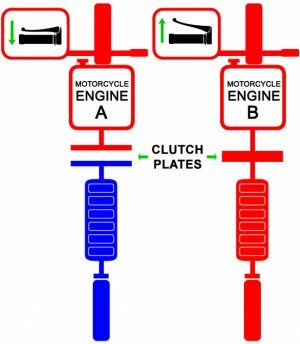 Holding the clutch lever partially in around the bite point / friction zone for longer periods other than moving off is called slipping the clutch. This is necessary as it allows the engine to spin faster but the motorcycle to move slower – a technique useful in slow moving traffic. However, only slip the clutch when it’s absolutely necessary as it causes excessive wear on the clutch.